KUALA LUMPUR, 19 Nov. 2010 – UKM is to lauch a new Industry-based PhD programme that wil enable those in the industry with just a first degree but with at least five years of experience in their particular line of work to undertake their doctorates. The students can continue working where they are and will be required to do their thesis based on their work. This was announced by Vice Chancellor, Prof Tan Sri Dato’ Dr Sharifah Hapsah Syed Hasan Shahabudin today at a Memorandum of Agreement (MoA) signing ceremony with The Malaysian Anti Corruption Commission (MACC). 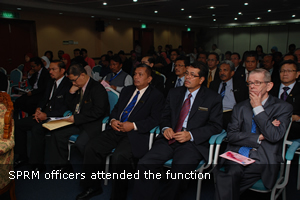 It allows MACC officers to do their post graduate studies on corruption at UKM. She said that UKM will also be offering officers from MACC to undertake corruption studies at the PhD level. “It is a move forward since UKM and MACC have already succeeded in tying up studies at Master’s level with our MoA signed in 2007,” she said at the Commission Academy in Persiaran Duta, here today. She said: “I think it is time we move forward. We change gear. Officers who already have a Master’s degree can do their PhD but we also recognise work experience.Those who have first degrees and have five years working experience can also apply,” she said. From the first MoA six MACC officers graduated with their Master’s degree during the 38th UKM Convocation last Aug. while the second batch of seven officers are scheduled to finish their studies at the end of 2010-2011 session. The Vice Chancellor also offered UKM certification for MACC short courses which have been getting very good response from overseas participants. She said if the courses were to be organised with UKM it is easy to get certification by presenting it to the University’s Senate since UKM have been given self-accreditation status. The students, however, needed to fulfilled 80 hours of study to get their certificates. Prof Sharifah Hapsah said the Master’s of Social Science (Corruption Studies) programme conducted by the Faculty of Social Science and Humanities (FSSH) aims at producing knowledgeable and authoritative officers. “These officers will be able to integrate theory and practices when carrying out their duties in their fight to eradicate corruption. “The programme will increase their knowledge and will help to upgrade their professionalism in carrying out their duties in eradicating corrupt practices which is becoming more sophisticated due to globalisation and development in information technology,” she said. MACC Chief Commissioner, Datuk Seri Abu Kassim bin Mohamed speaking at the ceremony said UKM was selected since it is among the foremost university in the country which conducts courses in social sciences and humanities that not only stressed on studies but also produced graduates with critical mind, strong moral fibre and having good communication skills. Abu Kassim said the programme was also part of the MACC’s efforts and initiative to increase the capacity and capability of its officers with its Academy (MACA) becoming the first to be established in the region offering professionally and systematically run courses. At the ceremony, Prof Sharifah Hapsah and the Dean of FSSH, Prof Dr Sharifah Mastura Syed Abdullah signed on behalf of UKM while MACC was represented by Datuk Seri Abu Kassim and the Deputy Chief Commissioner (Mangement and Professionalism) Datuk Zakaria Jaafar.